Now it's time to dowel our cake and prepare it for the second tier! To estimate where we will need to place our dowels, set an 8" cardboard round (the same size as our top cake tier) on top of the 10" cake. Using a bamboo skewer (or another pointed object), lightly dot around the edge underneath the cardboard round. This will be our guide on where to place our dowels. 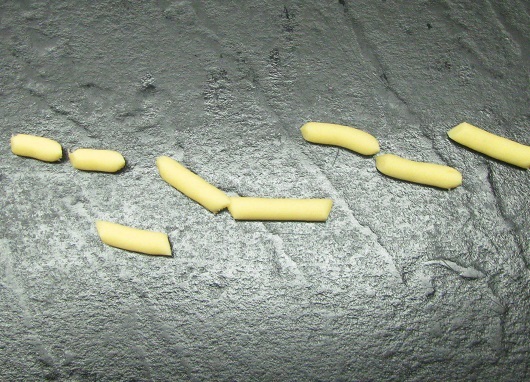 There are several different kinds of dowels sold at cake supply stores, and you can use whichever kind you'd like! But a cheaper alternative (and what I prefer to use) is long lollipop sticks! I use the Wilton brand long lollipop sticks. They are very sturdy and work very well supporting a second tier. If I were to make a 3 tiered cake, I would definitely choose something a little wider and stronger, but for a two tiered cake they work beautifully! 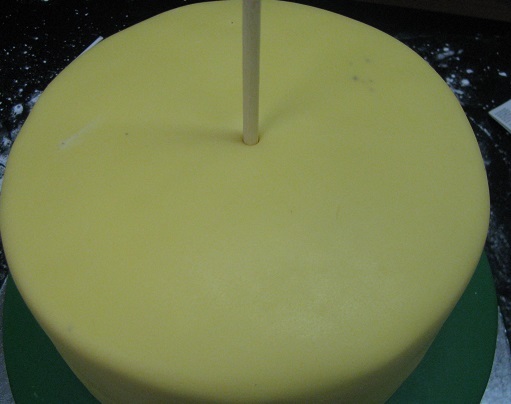 Using your markings as a guide, place plenty of dowels into your cake, about 1 inch inside the marked area. Be sure to leave the center of the cake open - we will need this space to place a large wooden dowel. 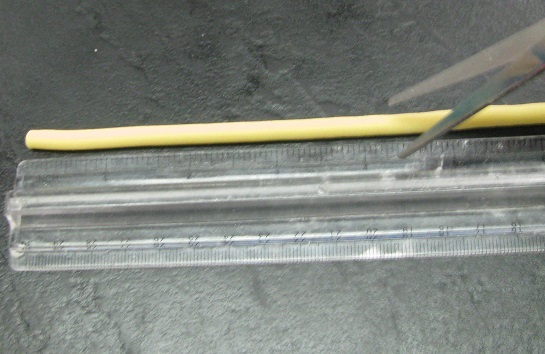 Using a pencil, mark one dowel just above where the fondant meets the dowel. 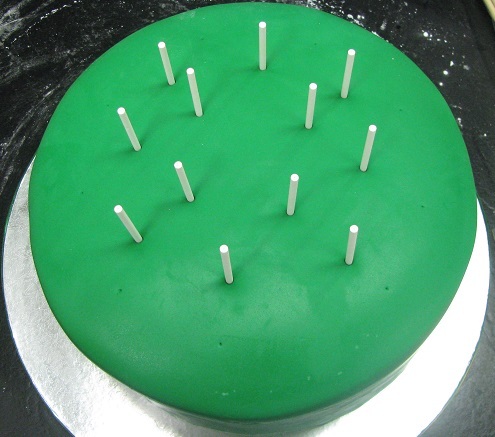 Next, pull the dowels out of the cake, and using a ruler as a guide, line up the dowels. And following the mark made earlier, draw a straight line across the dowels to mark where they need to be cut. This will ensure they are all the same height. Trim all sticks just below the marked line (this will remove the pencil mark from the part of the dowel that will be inserted into the cake). Place all dowels back into the cake. They should all be the same height and should all be just below the surface of the fondant. Have the second tier handy! We are about to place it on top of the bottom tier. Melt a little bit of Wilton candy melts and smear a bit onto the top of the 10" tier. 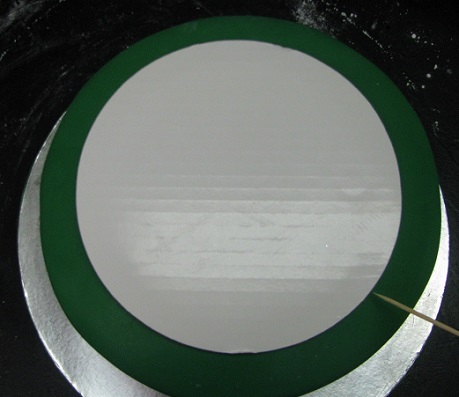 Quickly place the second tier on top of the bottom tier and center it as quickly as possible. Once the second tier is in place, it's time to run the large wooden dowel through the entire cake. Using a pencil sharpener (one that has never been used on pencils), sharpen one end of the dowel until is has a pointed tip. Push it through the center of the cake. Keep pushing until it pops through the cardboard round between the top and bottom tier. 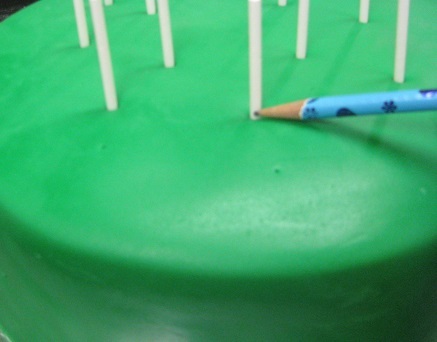 Using a pencil, mark where the fondant meets the dowel (the same way as with the lollipop sticks). 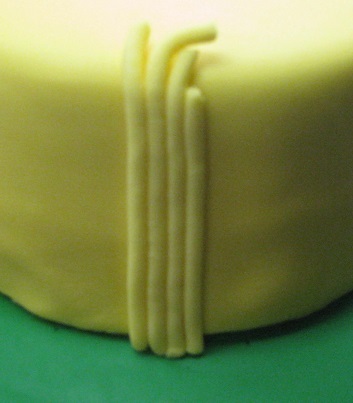 Remove the dowel from the cake and trim below the line. Place back into the cake, and using the piece that had been cut place it on the top of the center dowel and hammer down into the cake until the dowel has popped into the cake base. Next, set aside enough fondant to make the hay pieces. 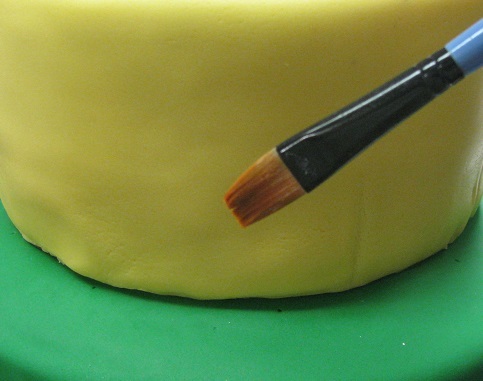 Color the fondant a light yellow with the Wilton's gel color in Buttercup Yellow to match the top tier of the cake. Using the palms of your hands, roll out a bit a fondant until it is slightly smaller than the barrel of the Clay Extruder. 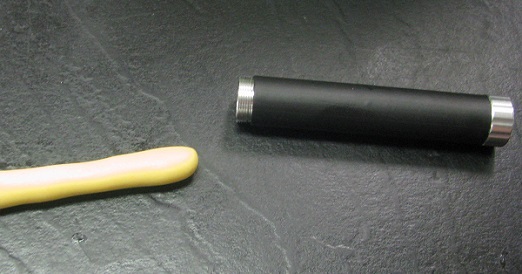 Fit one end of the clay extruder with a round disk suitable for making the hay pieces, and load the barrel with the fondant. 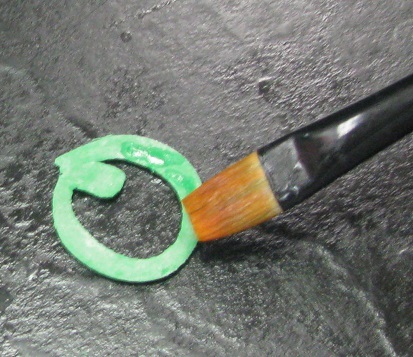 Attach the handle to the clay extruder and twist handle to push clay through the disk. Twist handle until all fondant has passed through the disk and the extruder is empty. With the cake measuring about 4 inches tall, you'll want to be sure the pieces of fondant cut for the hay will be long enough for the cake. 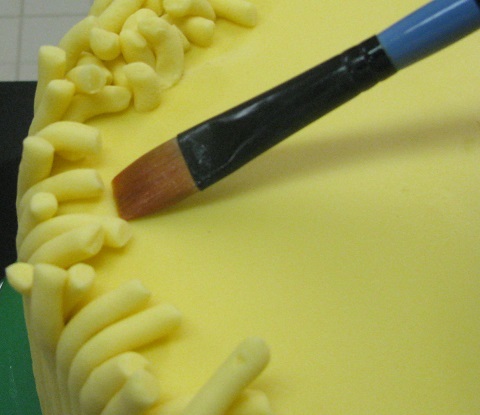 Use a ruler to measure the fondant and cut pieces from 4 1/4 inches to almost 5 inches in length. Be sure to vary the lengths within that range. Next, brush the side of the top tier with the edible glue mixture (50% water, 50% light corn syrup). Only cover enough space to fit the pieces of fondant that have just been cut. Press fondant pieces vertically on the top tier. Repeat these steps until the side of the top tier is completely covered. Next, using your clay extruder fitted with the same round disk, press more fondant for the top of the hay bale. Cut into small pieces, about 1/4" to 1 1/2". 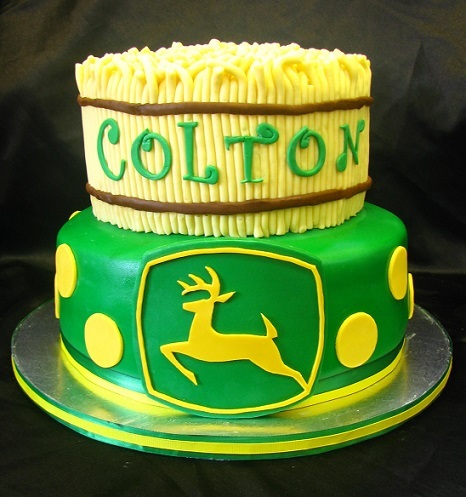 Brush the top of the cake, a little at a time, and attach small cut pieces to complete the hay bale. Now, to attach the Tappits letters to the front of the cake, brush the back of each letter with the homemade edible glue mixture and attach to the hay bale on the front of the cake. Once all letters have been attached, it's time to make the strings that go around the hay bale. Using a bit of fondant, color it brown with the Wilton gel color and knead until well blended. Load the clay extruder fitted with the same round attachment as before and press the fondant through. Brush a piece of the fondant string (long enough to go around the hay bale) with the homemade edible glue mixture and attach it to the hay bale. Be sure to press the fondant string to the hay bale to ensure it adheres well. Next, attach the ribbon around the bottom tier of the cake. 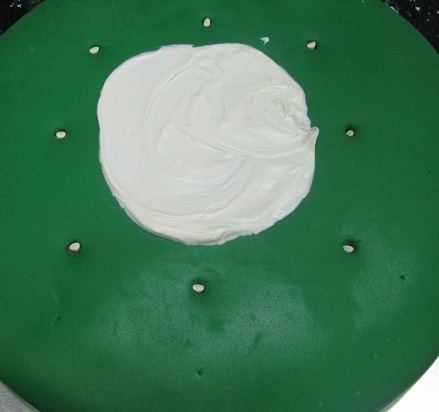 Wrap the large green ribbon around the cake to measure and ensure there is enough to overlap itself by at least 1/4", and cut. Do the same with the smaller yellow ribbon. 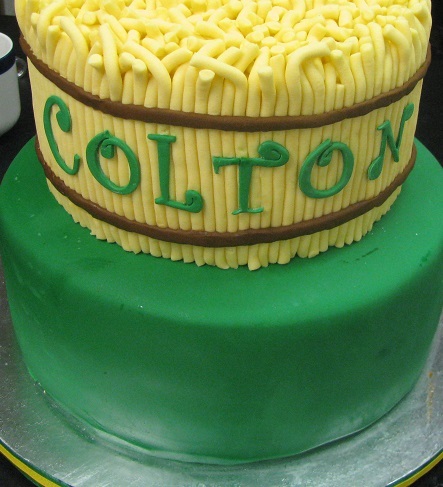 Pull the green and yellow ribbons taut (but not so hard that they leave marks), and glue them to the cake with a little butter cream, royal icing, or melted Wilton candy melts - whatever you have on hand - just where the ribbons meet on the back of the cake. 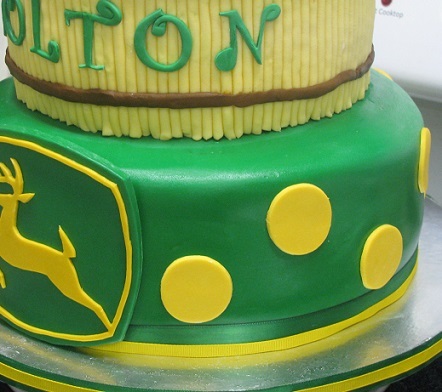 Next, brush the back of the Large John Deere logo with melted Wilton candy melts and attach to the center of the bottom tier of the cake. Oh, and notice the time on my stove? Yes, that is AM! 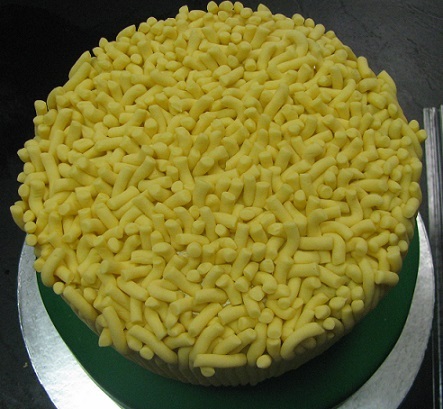 Oh, the life of a cake decorator! Now we're closing in on the finish line!! Phew! Finally! 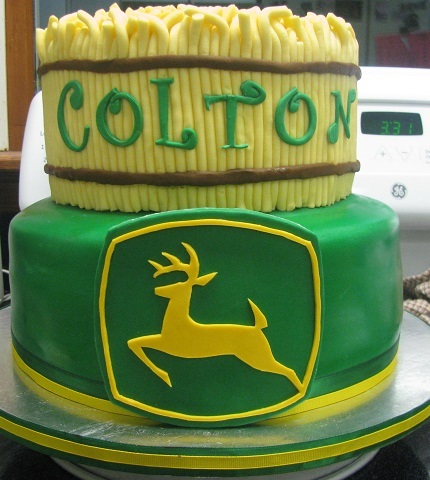 Color a bit of fondant with Wilton's color gel in Buttercup Yellow and Golden Yellow to match the deer on the John Deere logo. 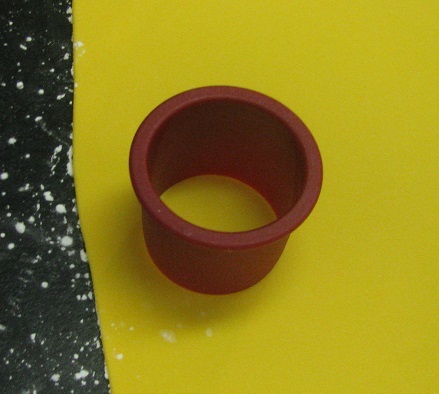 Roll the fondant out as thin as possible on a surface dusted with cornstarch. 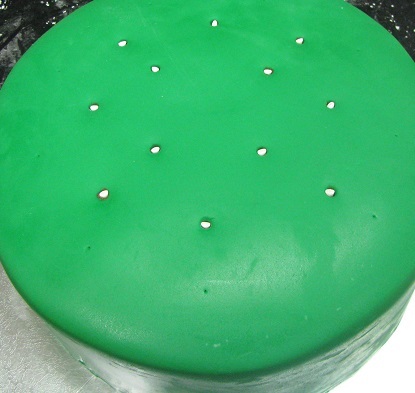 Using a circle cutter, cut out the polka dots for the cake. Brush the back of the polka dots with the homemade edible glue mixture and adhere them to the sides and back of the bottom tier of the cake. Thanks for taking the time to check out this tutorial! I hope it has helped you in some way! If you have any questions or comments please feel free to leave a message below, or you can contact me through a private message by clicking the "Contact Me" link on my home page. Have a great day and God bless!